1. Provo is an international destination. No, really. Hanging next to Danny Ainge's oversized jersey in from the rafters of the Marriott Center is that of Kresimir Cosic. Cosic, a 6'11" center from Croatia, became in 1972 the first foreign player to be named a UPI All-American. BYU's international pipeline has recently shifted to Brazil, where former Cougar and first round NBA draft pick (hey, don't laugh, it's true!) Rafael Araujo is from. Current Mountain West Conference Freshman of the Year Johnathan Tavernari and reserve forward Fernando Malaman are also Brazilian, as is assistant coach Walter Roese. BYU's student body is especially well-suited to welcoming international players, since more than 70 percent of BYU students are fluent in a second language. 2. Keena Young was born to play for BYU. You just wouldn't know that by looking at him. Keena Young, BYU's starting forward and the reigning Mountain West Conference Player of the Year, has a family history perfect for the university. 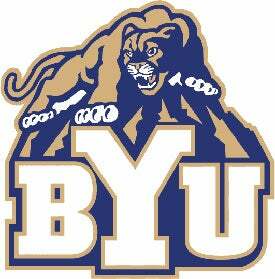 Of course, the Young family shares a last name with the university's namesake, Brigham Young. But Young's mother's first name, LaVella, is remarkably similar to that of legendary former Cougar Head Football Coach LaVell Edwards. And Young's father, Cleveland, shares a name with former head basketball coach Steve Cleveland, who recruited Young to BYU before leaving to take the head coaching job at Fresno State in 2005.